My Monotype Argo depicts the engineer Argo presenting a plan of the ship that he will construct and will eventually carry Jason and his crew of heroes on their quest for the Golden Fleece. Jason’s patron Goddess Hera, here represented by her totem or symbol, the Peacock, helped Argo select the timbers from the trees of Mount Palion to build the boat. She also supplied a limb for its keel taken from the sacred oak of the oracle at Dodona. The talking keel would aid the heroes in their journey with its gift of prophecy. When the ship was complete it was named for the builder Argo and thenceforth the heroes that sailed upon it would be known as Argonauts. 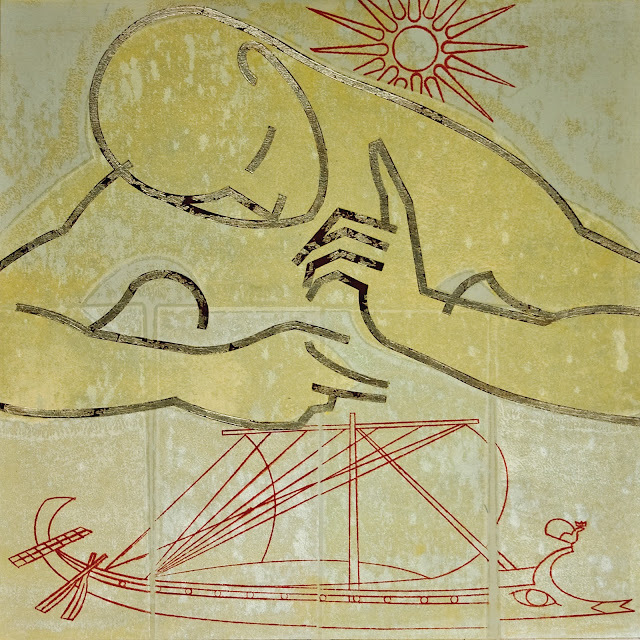 Argo is a Monotype with metal leaf mounted to panel. (16 x 16 x 2 in.) It will be exhibited in my studio, stop number 11, during the Vashon Island Holiday Studio Tour.